Camps Bay is one of the most popular areas of Cape Town. Self catering accommodation and Camps Bay villas are booked well in advance of the summer season. This beautiful beach suburb is characterised by its wonderful combination of incredible scenic beauty and its vibrant, cosmopolitan nature, making it a fantastic destination for Cape Town holiday makers and locals alike. Camps Bay is situated on the Atlantic seaboard and is recognised as one of the most upmarket areas of Cape Town. Villas, self catering holiday apartments and rental holiday homes extend from Camps Bay beachfront up the hillside of the Twelve Apostles, a breathtaking mountain range which runs from Table Mountain to the tip of the Cape Peninsula. At the foot of Camps Bay are the white sands of Camps Bay beach; famous for its cobalt blue waters, substantial size, beach sports and activities, and the palm-tree lined promenade which runs the length of the beach. If you don’t feel like dining at your holiday villa or rental apartment, Camps Bay beachfront features an irresistible collection of Cape Town s finest restaurants, bistros, street café’s and cocktail bars. Feasting on world-class gourmet cuisine, sipping on a decadent summer cocktail or enjoying a picnic on the beach, Camps Bay beachfront is the place to be, and be seen. To the one side of Camps Bay is the equally exclusive and highly upmarket area of Clifton, renown for its four wind-free beaches and surrounding apartment complexes & sprawling holiday villas. To the other side of Camps Bay is the more private but equally exclusive beach suburb of Bakoven. Bakoven offers it own semi-private beach and a charming collection of beach bungalows, holiday homes and other self catering accommodation, for those looking to be close to the excitement of Camps Bay and yet wanting a quiet holiday location. Other attractions of Cape Town such as Table Mountain and the V&A Waterfront are all short minutes drive from Camps Bay. Located at the foothills of Lions Head in the most exclusive part of wind-free Fresnaye (Cape Town), the exquisite, multi-levelled architectural masterpiece sleeps 8 guests, celebrity-style, and offers complete privacy complete with all modern convenience..
5 Star Grading from the Grading Council of South Africa. Chic and luxurious, Glen Beach Villa No. 1 offers first class holiday accommodation in the highly popular Cape Town beach suburb of Camps Bay. ..
South Beach Apartments are ideally situated on the well-known Camps Bay strip.. ..
South Beach Apartments are ideally situated on the well-known Camps Bay strip. ..
La Maison Hermes is positioned at the foot of the Twelve Apostles Mountain range offering a central location that is within close proximity to the city as well as to the beach. .. Enjoy the luxury of your own spacious residence that ensures not only peace and quiet but also independence and privacy. ..
High on the slopes of the Twelve Apostles in Camps Bay, Oudekraal Lodge is a comfortable, contemporary-chic abode. ..
Tucked away on a quiet street in the heart of Camps Bay, Villa Olivier is a beautiful, contemporary-chic retreat with spectacular mountain and sea views. ..
A wonderfully elegant, yet family-friendly property on the slopes of Camps Bay’s Geneva Drive, Palm Beach offers home-away-from comfort. ..
Sunset Blue, a comfortable one bedroom apartment in a secure complex is a perfect home away from home for the single traveller or couple to Cape Town. .. This stylish, incredibly spacious split-level Penthouse boasts an amazing view of the ocean and Lion’s Head, has safe parking in an indoor garage with direct access via a key-operated lift, and an alarm system. ..
Hakue is a magnificent split level designer Villa in the quiet side streets of Camps Bay. Architectural innovation places Hakue in a class of its own. ..
Berkley Place is lovely three bed, two bath semi detached double story vacation rental just a short walk from Camps Bay beach. ..
Silvertree is a gorgeous four bedroom luxury retreat, spread across three levels with an additional self-contained, two bedroomed cottage. ..
Blinkwater Villa is a beautiful, contemporary 4 bedroom holiday Villa, tucked away in a quiet cul-de-sac in Camps Bay, just a short walk from the beachfront with bustling shops and restaurants. ..
Strathmore Manor is a cosy three bedroom property in the sought after Strathmore Road. ..
‘On the rocks’ is a pristine, two bedroom luxury beach cottage right on the water’s edge in a secluded cul de sac in Bakoven. .. Studio Colorato is the perfect little spot for guests to escape and enjoy the famous views of Camps Bay. ..
Driftwood is a comfortable, two bedroom apartment high up on the hills of Camps Bay. ..
Sea Escape is a pristine 2 bed apartment. Styled in shades of white, this apartment is airy, clean and serene. White on white tones carried throughout the entire apartment compliment natural tones of grey and beige in scatter cushions and stylishly placed..
Perched on the top floor of the Famous Sonnekus ‘Brownstone’ of the Camps Bay strip, Marino Atico is a perfect Sunset treat for the leisure traveler.. 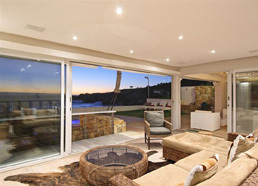 Studio de Cruz is a spacious luxury vacation rental in Camps Bay. With fabulous views of the Atlantic ocean and the Twelve Apostle Mountain Ranges, this apartment is perfect for a couple looking for self catering accommodation in Camps Bay. .. This small, sheltered but well appointed 1 bedroom apartment is set on the ground floor of the Houghton Heights building. The Famous Houghton Steps are just meters away, allowing quick access to Victoria Road and Camps Bay Beach. .. This beautiful 3 bedroom apartment is set on the first floor and is set back slightly from Bali Bay, just a few minutes' stroll from one of Cape Town's most exclusive suburbs, Camps Bay. .. The Penthouse Apartment is Camps Bay Terrace’s premier accommodation. Come and treat yourself to absolute luxury with spectacular views of the Twelve Apostles and the Atlantic Ocean. .. Enjoy the old world charm of this lovingly refurbished colonial home! The Lodge is a lovely three-bedroom apartment, ideal for a group of friends or a family. .. This apartment boasts the most flawless, breathtaking endless views and is comfortable to enjoy under all conditions. ..